Thank you for your interest in WBOC.com. How do I submit a story idea or news tip to WBOC.com? Where can I search for stories posted on the website? How do I locate a story that I do not see posted? I would like a copy of a video that aired in your TV newscasts. How would I go about obtaining one? Does WBOC deliver news to mobile devices? Does WBOC offer a TV app? Where can I find WBOC on social media? Does WBOC offer any email newsletters? How do I advertise on Draper Media's TV, radio, digital properties or digital marketing services? How do I nominate an athlete for the WBOC/Mountaire Farms Scholar Athlete of the Month award? Does WBOC.com provide technical support? How does WBOC.com protect my privacy? How do I make WBOC.com my home page? How do I add WBOC.com to my list of favorites? WBOC.com does not appear to be updating -- the timestamp is out of date. Email us at news@wboc.com or call our newsroom at 443-880-9148. To send us postal mail, write: WBOC, 1729 N. Salisbury Blvd., Salisbury, Md. 21801. Where can I search for stories posted on WBOC.com? To search for articles posted to the website, enter a search term in the Search box at the top left-hand corner of each page. The best way to find a story you do not see posted is to search by keyword in the Search area of every page on WBOC.com. While the editorial staff of WBOC.com does everything it can to post as many stories and videos on the site as possible, not every item that appears on WBOC TV gets posted on WBOC.com. Likewise, not every item that is posted on WBOC.com necessarily appears on the WBOC TV news. For stories that you may not see on WBOC.com, you may want to search the websites of CBS News, CNN or The Associated Press. At this time, WBOC's station policy does not permit us to issue copies of our videos for either free or for purchase. However, many of WBOC's videos that appeared in our TV newscasts are posted on WBOC.com and can be viewed in the site's "Videos" section. WBOC also livestreams its newscasts on multiple platforms including the WBOC mobile app, the WBOC TV app on Apple TV, Roku and Firestick and the WBOC Facebook page. Past newscasts can be viewed here. Does WBOC deliver news and weather to mobile devices? Yes. WBOC offers both news and weather apps, available for iOS and Android devices. The WBOC News app offers the latest news, weather and sports, as well as live streaming video and video on demand clips. To download the iOS version from the App Store, click here. For the Android version, click here. The WBOC Weather app is a full-featured weather app that includes daily and hourly forecast information, a responsive interactive map, radar and satellite images, the ability to save favorite locations and much more. To download the iOS version from the App Store, click here. To download the Android version, click here. Yes, WBOC offers an over-the-top video on-demand TV app available on Apple TV, Roku and Firestick that provides on-demand video clips. An OTT app for WBOC's lifestyle show DelmarvaLife is also available on Apple TV, Roku and Firestick. Does WBOC.com offer any email newsletters? Yes, WBOC.com provides several different types of newsletters, including daily news headlines and daily weather forecast emails. To sign up for WBOC's newsletters click here. Please email Frank Hamilton at fhamilton@wboc.com or cdashiell@wboc.com . Information about how to nominate an athlete for the award can be found here. WBOC.com does not provide personal technical support. If you are unable to find a solution to your problem in the links provided, you may want to check with your computer manufacturer or Internet service provider. The collection and use of every WBOC user's personal information adheres to WBOC's privacy guidelines and user agreement. To learn more, click here to read WBOC's Privacy Statement. Open your Chrome browser and click on the menu icon represented by three lines on the top right corner of the screen next to the Web address input field. Choose "Settings" from the drop-down options. In the "Settings" screen, check the box labeled "Show Home button". Once the box is checked, click the "Change" button located next to the address shown below the Show Home button. Change the address to your preferred homepage to http://www.wboc.com . Open a tab with the web page you want to use as your home page, which will be http://www.wboc.com . In the Homepage field, enter http://www.wboc.com . Choose when your homepage is shown: ? Open Chrome and go to http://www.wboc.com. To the right of the address bar, click Star . Open Firefox and go to http://www.wboc.com. Click on the star in the address bar. The star will turn blue when the page is bookmarked and a window will pop up so you can name, move or tag your bookmark. This usually happens because your browser is storing (or caching) web content locally on your device instead of downloading it from the website every time. This enables the site you’re viewing to load and run more quickly. However, sometimes that also can mean you're seeing an older version of a site like WBOC.com. 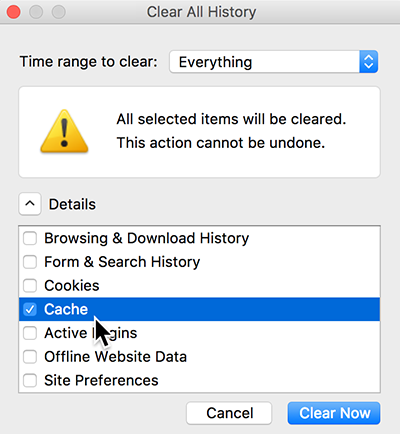 The problem can be remedied by clearing your browers cache. Click (Customize and control Google Chrome). Select History and recent tabs, and then select History. 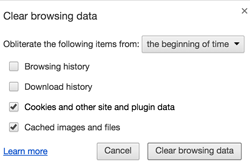 In the area at the top, click Clear browsing data. Note: Selecting Cookies and other site and plugin data can also help resolve some issues, but deleting your cookies also deletes passwords stored in your browser. Reopen your browser and try viewing http://www.wboc.com again.